Dar es Salaam landscape is going change for the better in the coming months as the city adds another landmark project to its rapidly changing face. According to sources, Dar es Salaam will have a new multi-billion shilling by-pass - the Selander Bridge - within three years. The project to build the USD 126.26 million (over Sh284 billion) bridge - that will start all the way from Barack Obama Drive to connect the Aga Khan Hospital and Coco Beach at the junctions of Kenyatta and Toure roads - was officially signed off between the Tanzania Roads Agency (Tanroads) and GS Construction Company of South Korea. Several projects are currently at different stages of implementation as the Tanzanian government races to curb traffic congestion on Dar es Salaam's roads, a move that would save the economy from a Sh4 billion loss daily. This includes the signing of an MoU between the governments of Tanzania and South Korea for the construction of a U.S.$126.26 million Selander bridge. Tthe construction of the Dar es Salaam Rapid Transit was pushed due to a study which revealed that the economy had been losing Sh4 billion every day from traffic jams in the Tanzania's largest commercial city. This does not even include the fact that workers spend hours on their way to workplaces (lost man hours) while environmental pollution has also been a major reason not to mention health concerns generated by the subsequent pollution. Similar projects also include the USD 45 million Tazara flyover which is fully-funded by Japan via Japan International Cooperation Agency (Jica) and is projected to be completed by October, 2018 and the construction of the Sh177.4 billion three-storey Ubungo interchange undertaken by the China Civil Engineering Construction Corporation (CCECC). Ubungo is one of the city's busiest locations with more than 65,000 vehicles using the route daily. Including the previously sanctioned $135 million (Sh290 billion) Kigamboni Bridge, the Tanzanian government is also on various stages of the wider plan to build seven new flyovers in Dar es Salaam. The junctions of Chang'ombe, Uhasibu, Kamata, Morocco, Mwenge, Magomeni and Tabata are also being developed. 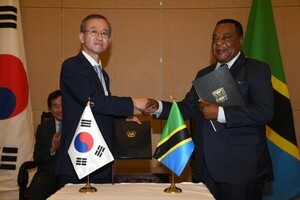 South Korean Premier Mr Lee Nak-yeon and his Tanzanian counterpart witnessed the signing of contract between Tanroad and GS Construction Company. The South Korean government through Exim Bank has extended help to Tanzania offering soft loans for construction of the Mwanza-based three kilometre Kigongo-Busisi Bridge.